Hey guys, I have updated the TiO2 structure. Hope that would be useful for you. And actually people have tried TiO2 nano-wire for DSSC, although there are improved electron and hole separation rate, the surface to volume ratio is not high enough compared with the nanoparticle, hence not much improve in the efficiency. I am wondering if you are using any reference capacitor like in the figure when you are characterizing the ferroelectric capacitor? From the capacitance information how do you extract the polarization (P)? And last question is what do you do with inductance of a ferroelectric capacitor, does it tell anything? Here is some information about LCD. Hope it will help us to understand some more about LCD. The stereoscopic system that includes a pair of high-resolution wide viewing angle displays, each of the high-resolution wide viewing angle displays having a relatively vertically oriented plane polarizer and a relatively horizontally oriented rear polarizer. One of the polarizers is at the front and the other of the polarizers is at the rear. With the respective high-resolution wide viewing angle displays, the method including re-orienting the front and rear polarizers on one of the high-resolution wide viewing angle displays by 90 degrees; or arranging the high-resolution wide viewing angle displays at an angle which is relative to one another, then positioning a beam combiner between the high-resolution wide viewing angle displays such that the beam combiner transmits light from one of the high-resolution wide viewing angle displays and reflects light from the other high-resolution wide viewing angle display in substantially the same direction such that light from the respective displays is orthogonally polarized. That is a good question. I think to select a catalyst for a specific reaction need a lot of empirial and theoretical work. You need to take into consideration of the mechanism of the chemical reaction, and the structure and the nature of the catalysts. Take the hydrogenation of CO for the methanol synthesis as an example. Cu-Zn-Al was the conventional catalysts for this reaction. It has several advantages, 1) high activity 2) low cost 3) long life, Palladium could be a good hydrogenation catalyst, however, compared with copper based catalyst, it was so expensive for commercial use for this reaction. But for another reaction, like selective hydrogenation of ethyne to ethylene, palladium is widely used. Because in this reaction, we think the selectivity is far outweigh the other parameters, like the activity. palladium catalyst has a good selectivity, it could selective absorb ethyne to its surface. Especially, for this reaction , the reactant, I mean, in the industrial process, contains only a rather small amount of ethyne. So not too much catalysts are needed for this reaction, in other work, supported noble metals, catalysts containing Pd<1% is enough for this reaction. To evaluate whether a catalyst is suitable for a reaction, you need to consider the catalysis activity, the selectivity, the life , the cost, ,,,,So,it always takes many years of repeated experiments from invention of a novel catalyst, then laboratory test, then pilot plant test to prove it, until it finally could used in the industrial process. Thank you Maria, it helps me to understand HEMT! Another point is the uncertainty principle says $\Delta E\Delta t\geqslant\hbar/2$. If the pulse is too short, then the time difference between the beginning and the end of the pulse is too small, then the energy difference would be very large. Or the spectrum of the laser would be wide, which is not good for a laser. So there should be a compromise. Hi, Fangxiao. Let me explain in this way. Assume that in the gain medium, there are more electrons in the low energy state, and this is true most of the time. Then we provide some illumination on the medium. Although stimulated emission will give out photons, more photons are absorbed by the lower energy electrons. So the total light intensity is decreased. That does not make sense because we need a large amplify of the incident light to get a laser. In other words, it is mandatory for a laser to achieve population inversion. Gain medium is that the material which has a suitable energy level scheme for population inversion. Laser gets amplified within the material. So we call it "gain". So if any new material with such a scheme, and the upper level lifetime for electrons is comparable to the lower level lifetime, it may be suitable for laser. And usually, in semiconductor lasers, people just use several layers of different depositions to form the gain layer and resonant cavity layer. DFT helps a lot in modeling such complex situations. LDA is part of approximation considered in DFT to find exchange correlation term in the Hmiltonian. I have listed some limitations. The population inversion phenomena is very interesting! Does this increase the laser emitting energy? And is the gain medium an requirement of the population inversion? Can you explain in more detail about how to form the gain medium? Thank you! Good question Jialan, yes every thing can be found by solving Schordinger equation correctly. We do not require any experimental input what so ever. But we should compare some values to available value from experiment to make sure that things are done correctly. N-type and p-type doping gives the following different energy band structures. 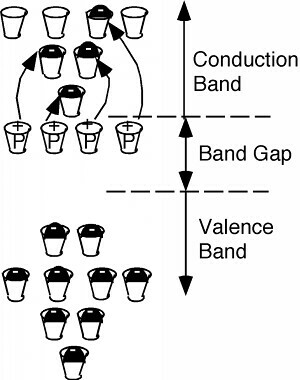 In the case of a donor atom in the lattice (n-type doping), there will be creation of extra states located close enough to the conduction band, so that the electrons which they contain are easily excited up into the conduction band. 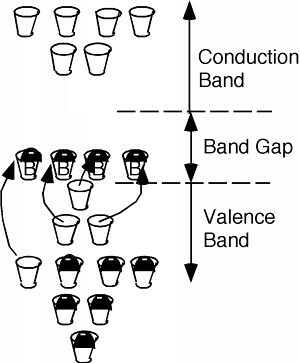 On the other hand, in the presence of an acceptor (p-type case), the absence of an electron will create a new set of states very close to the valence band. Electrons in the valence band can be thermally excited up into these new allowed levels, creating empty states, or holes, in the valence band. The excited electrons are stuck at the boron atom sites and act as fixed negative charges, localized there. The images are oversimplified but, still, I believe they give a very vivid representation of each case. Dear Satyesh, would you simply introduce the difference of DFT and LDA, since LDA is the approximation of Density function? And what is the limitation of DFT method now? Dear Vincent, would you talk about the actual critical temperature of superconductor materials? Is there any progress in finding high critical temperature superconductors? I think this is very important for the commercialize of superconductor. Thanks! By the way, good page! Would you introduce briefly how polarization is achieved within LCD? And which material is applied? I uploaded four files to this page. Please see the attached files. Thanks!